Delaying our family until we were finished with school meant that we could be the best parents possible for our children. 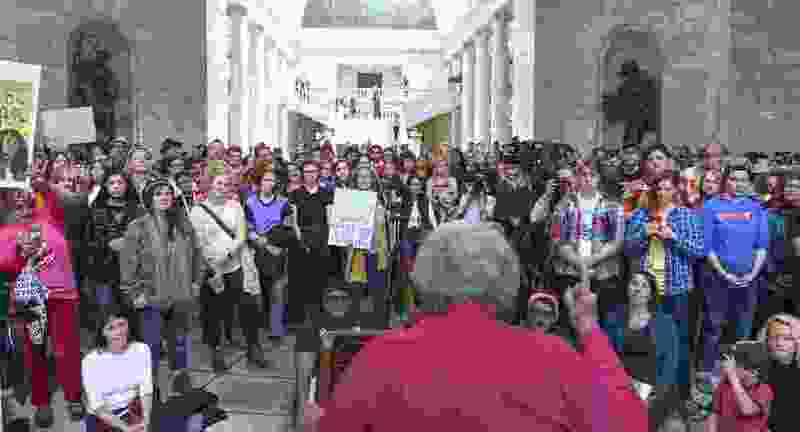 (Leah Hogsten | The Salt Lake Tribune) Karrie Galloway, CEO of Planned Parenthood, rallies those in attendance at the Amplifying Women's Voices rally to celebrate International Women's Day at the Utah Capitol Rotunda, hosted by KRCL, Thursday, March 8, 2018. Because of Planned Parenthood I have two healthy, thriving children. During my late 20s, I worked two jobs to put my husband through graduate school. He couldn’t work and complete school, so it was up to me. Even with a full-time and a part-time job, I couldn’t afford to pay for health insurance. I went to Planned Parenthood for help. Thanks to Planned Parenthood, I was able to get quality care at an affordable price, which allowed me to plan my family. When my husband and I both finished school, we were ready to start a family. Planned Parenthood staff had kept me healthy for years, and they advised me regarding conception and creating conditions for an ideal pregnancy. With their advice, and a lot of luck, I was able to conceive easily and experienced healthy pregnancies without complications. Every family is different. Each family should be trusted to know what is best for them. For us, delaying our family until we were finished with school meant that we could be the best parents possible for our children. When speaking about Planned Parenthood, I always emphasize the “Planned” part. Planned Parenthood wants to help women become mothers when they are ready to become mothers, when they can plan for it. We should all want that. Who knows the ideal time better than the women themselves? Certainly not politicians. Sadly, that’s what so many politicians are trying to do. From the Trump-Pence administration to our own Utah Capitol, too many politicians think they know what’s best for women. They are trying to keep people from getting the birth control and other reproductive health care services they need. They are trying to stop people from going to Planned Parenthood by making it harder for Planned Parenthood to receive funding through Title X. Planned Parenthood trusts women to make decisions and gives them the resources to support those decisions. I’m so glad Planned Parenthood was there for me when I needed it, and I will continue to support Planned Parenthood so it is there for my daughter. Tory January is an educator living in West Jordan, and a supporter of Planned Parenthood for over 30 years.